Being a geek, I love a lot of toys, cartoons, tv series, comic books, etc. and after seeing enough of them remade–horribly–I’ve resigned myself to the fact that it’s not about preserving the artistic or entertainment value of the original properties, it’s about making a buck and marketing to the current/next generation of consumers. That said, even I bristle at the marketing tie-ins for the upcoming movie version of Dr. Seuss’ “The Lorax”. Written in 1971 and adapted for television in 1972, the story has been both praised and denounced for its environmental messages. The character of The Lorax may be a grumpy environmentalist, but speaking up for “nature” which cannot defend itself is something that’s easy to relate to, even for kids. And while I don’t plan to watch the remake, I did recently re-watch the original special and find some of the sponsors and products a bit odd considering the story’s material. Most notably is Mazda’s new CX-5 “crossover” SUV which is admittedly more eco-friendly than the traditional SUV–smaller body, better technology–but is it the most eco-friendly car one could drive?3 Better question, if The Lorax saw a bunch of these vehicles lined up–as in the novel and tv special–to buy a bunch of Thneeds from the dwindling Truffula tree forest… would he be happy? Would he permit the Truffula trees to give it their Seal of Approval? 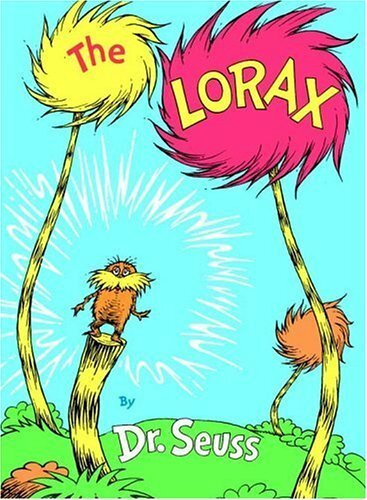 Considering how distressing it was that the Once-Ler would create first a drive-through and then demand the forest be paved over to develop a four-lane highway… would The Lorax perhaps instead suggest that you enjoy the splendor of the forest on foot or a bike? And then there’s IHOP… which just seems weird. IHOP is rolling out a movie-inspired, limited time menu for guests of all ages, featuring The Lorax’s Breakfast, Pipsqueak’s Breakfast, or Mac ‘N Cheese & Truffula Trees. The seed paper bookmark is a nice touch but I’m not sure about calling rainbow sprinkles “Truffula Chips” and broccoli florets “Truffula Trees”. And especially a “Rooty Tooty Bar-Ba-Looty Cone Cake” when the point of the book was that the Bar-Ba-Loots no longer had anything nutritious to eat, so naming a pancake and blueberries stuffed into a waffle cone after them doesn’t really seem on message. 1 And neither should you, I don’t care what message board you’re trying to use to express your “outrage”. It makes you look like an insensitive myopic troll. 2 Transformers… I’m mostly looking at you. 3 To my knowledge, there is no such thing yet as a total-zero-emissions car from a big picture perspective, so that’s not really an argument I can get into here. Next story tv: gay shows a no-go for Logo? Previous story video: Choccy Philly? IHOP must have some sort of agreement about the food related merchandise, since they did the “Horton Hears a Who” menu last year. However, in comparison to the Lorax menu, I think the Lorax menu is a wee bit better to eat. Mazda seems to be telling me if they can’t win an award for being “green” then make one up! I was so irritated by the trailer for The Lorax the first time I saw it – during the Super Bowl – that I now mute it every time it comes on. The amount of fat and gender shaming they squished into one clip is just too much. The conservatives are worried about the movie messaging some environmental defense indoctrination to children (like that would be such a bad thing! but don’t get me started…), but I cringe to think the shaming gets pretty much a unilateral pass, as usual.